AUDUSD in near terms: The pair should remain in the upper part of the past week’s range around 0.7150 levels. AUDUSD medium-term perspectives: The FOMC’s dovish turn helped drive AUD to near 0.7300 levels while the RBA’s subsequent switch to neutral produced multi-week lows around 0.7050 levels. Meanwhile, Australia’s key export prices have bounced, notably 2-year highs for iron ore. With pricing for RBA easing aggressive and the wary Fed outlook supporting global risk appetite, AUDUSD should continue to find support on dips towards 0.70 levels, capped at 0.73 levels and ending Q1 around 0.71 levels. We assume some version of a deal from US-China trade talks. 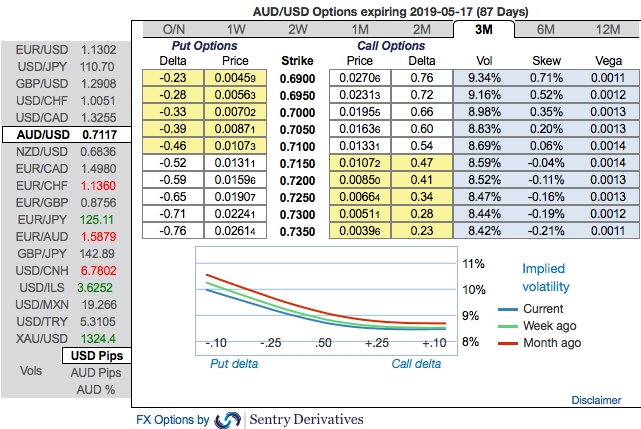 OTC outlook and Hedging Perspectives (AUDUSD): Let’s just quickly glance through OTC outlook of AUDUSD, before deep diving further into the strategic framework. Please be noted that the positively skewed IVs of 3m tenors signify the hedgers’ interests to bid OTM put strikes upto 0.69 level which is in line with the above bearish scenarios (refer 1st nutshell). While mounting numbers of bearish risk reversals and bearish neutral RRs of the 3m tenors that are also in sync with the bearish scenarios refer to 2nd (RR) nutshell. In a nutshell, AUD OTC hedgers’ sentiments substantiate that their risk mitigating activities for the downside risk have been clear. Currency Strength Index: FxWirePro's hourly AUD spot index is inching towards -68 levels (which is bearish), while hourly USD spot index was at 14 (mildly bullish) while articulating (at 07:29 GMT).